Rasit Bagzibagli collection at Dubai Modest Fashion Week. photo by Rufool Ali. Dubai Modest Fashion Week puts on a global feel for future. A week ago, on a rare cloudy day in Dubai, the Emirate saw the launch of its first ever Modest Fashion Week. Despite its chaotic beginning, the event concluded on a positive note that resonated with the participants. The opening featured some of the industry’s icons like the world’s first hijab-wearing model Halima Aden, members of the royal family including Sheikha Hend Faisal Al Qassemi, and the popular singers Diana Haddad and Abdullah Balkhair. Partnering with a local organizer, Red Connect, the Modest Fashion Weeks’ founders Franka Soeria and Özlem Şahin faced a few challenges at the initial stages in terms of paperwork and permits as well as adjusting to the work culture of a new city. “I should write this amazing experience somewhere… It’s surreal! 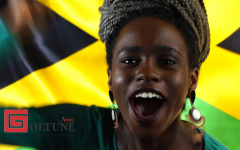 I will never forget this moment and I thank everybody who helped us to make things happen,” Soeria said in a Facebook post that she shared with Goltune. Throughout the show, Soeria had been overseeing every aspect of the event, welcoming guests at the entrance, speaking to the press in the media room, and making announcements when needed. Despite her efforts, attendants could feel the chaos brewing behind the scenes. Just a few minutes before chairwoman of Rewaq Ousha Bint Hussein Cultural Center, Mouza Obaid Ghubash, inaugurates the event on the main stage, attendance were directed to the entrance of the runway by the staff. After waiting in front of an empty runway, the MC’s voice coming through the loud speakers led some back to the inauguration. The fashion shows were also delayed by about an hour. Whether that was due to the earlier confusion was never made clear. When the chaos receded, and the attendants were comfortably seated in anticipation for the fashion show, Dubai received its first doze of torrential rain since the previous winter season. By the time the staff realized they should rush to arrange for umbrellas for the VIP guests, the open-air venue was drenched. As a result of these weather conditions, which caused a power outage, the rest of the show was postponed to the following day. Models_Halima-Aden and Tulin Sahin, backstage. While the organizers were better prepared on the second day, which went more smoothly, lack of organization prevailed in the overcrowded backstage. “Backstage needs a little more organization because it was way too crowded. I think every designer should have had their own moment backstage,” Fahima Saidi, fashion director and stylist of the US-based Fllumaé, said. Nonetheless, the show continued, and the participation remained strong, with sore throats and fevers from the previous day’s rain disguised behind smiles, makeup, and fine embroidery. Over the years, the market of modest fashion has been steadily growing, with the number of consumers increasing by 5.7% in 2015 year-on-year. During that year, according to a report produced by Thomson Reuters and Dinar Standard, Muslim consumers spent almost $243 billion on clothing. This represents 11% of the global market and has contributed $44 billion to the sector. The online fashion outlet Modanisa, co-creator of the Istanbul Modest Fashion Week, was heavily involved with the organizers, curating the opening shows and using the company’s contacts to attract more influencers and media. According to a spokesperson from the company, the brand also played a key role in securing the exclusive involvement of supermodels Halima Aden and Tulin Sahin as well as the participation of designer Rasit Bagzibagli. Such efforts gave the event a diverse, global atmosphere, which didn’t go unnoticed. This was strongly felt by Fllumaé’s Saidi, who also participated in the London event as well. “Our favorite part was seeing a lot of designers and bloggers from all over the world being able to come together. This event was a lot different compared to London Modest Fashion Week. It was definitely bigger and better,” she said. 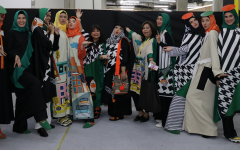 As for the Indonesian fashion designer Anggiasari Mawardi, creator of the Anggia Handmade brand, it was the event’s diversity that stood out the most. “The people who came to Istanbul were all modest and hijab-wearing dressers from many countries. But in Dubai, the atmosphere was totally different. The people who came are not only hijabis or influencers. Rather, they were professionals from the fashion industry,” she said. German Meriem Lebdiri, creative director of the fashion brand Mizaan, echoed the same sentiment. Having attended all three events, she believes that the Dubai Modest Fashion Week offered better networking opportunities, compared to the previous shows. “The highlight for me was connecting with many great people and keeping in touch with them for future projects. Even though it’s my first time showcasing in Dubai, I never felt like a stranger. I think this goes back to the organizers who have an international mindset and think globally,” she said. In the future, Soeria has the intention of returning to Dubai with a new edition of the show. Now that her team is familiar with the process, she hopes that the next experience will be better. For others like Modanisa’s CEO Kerim Türe, he hopes to see more interest from the mainstream fashion brands. 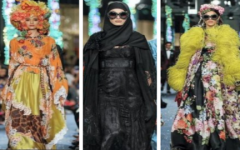 Recently, brands like Dolce & Gabbana (D&C) and Burberry have indeed started producing modest fashion collections, leveraging from the sector’s rapid growth, which is expected to reach $368 billion by 2021. “I feel if we can draw in one major fashion brand to present at the next Modest Fashion Week, then we will not only change perceptions, but increase collaborations between these currently distinct worlds, which in turn will be good news to fashion lovers everywhere,” he said.